Home » Amazing » World’s Weirdest Record Holders. By Sparky in Amazing on August 27, 2009 . A couple kisses in front of Budapest’s Parliament during an attempt to break a Guinness record for simultaneous kissing on June 9, 2007. Hungarians broke the world record for simultaneous kissing on Saturday when more than 6,400 couples joined lips for a few seconds at a party outside the country’s parliament, the organisers said. Thousands of naked volunteers pose for US photographer Spencer Tunick at Mexico City’s Zocalo square May 6, 2007. A record 18,000 people took off their clothes to pose for Tunick on Sunday in Mexico City’s Zocalo square, the heart of the ancient Aztec empire. 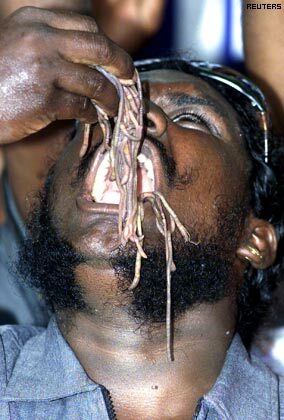 An Indian man swallows worms to set a new Guinness world record in the southern Indian city of Madras November 15, 2003. The man swallowed 200 worms in 20.22 seconds and broke the current record of 94 night crawlers in 30 seconds set by Mark Hogg of America in 2000. Septuagenarian Isobel Varley poses during ‘II Expotatoo’ tattoo fair in Gijon, northern Spain, May 15, 2009. Varley, who was born in 1937, is the most senior tattooed woman in the world according to the Guinness World Records. Bras are seen hanging in the Belgian seaside city of Oostduinkerke on August 13, 2005. About 9,829 bras were knotted together breaking the previous world record held by its rival city Tongerlo, according to local media. Organisers say they will try to enter the Guinness Book of Records. 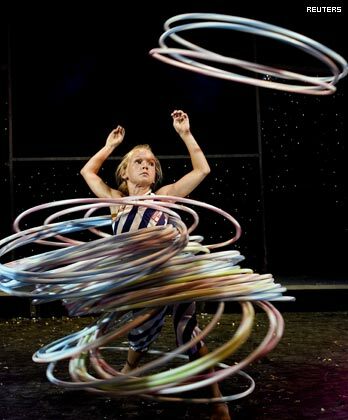 Sofie Schwarz of Denmark, 11, attempts to break the children’s world record of ringing 88 hula-hoops at the same time in Copenhagen on July 27, 2006. 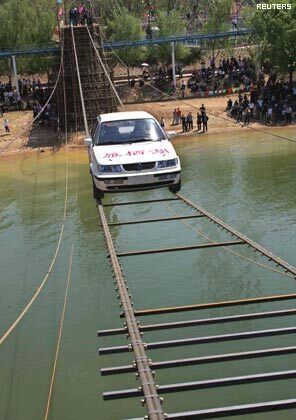 A Guinness World Records holder Yang Xiangdong drives a car through 60-meter steel tightrope at the Yanxi Lake in Beijing on May 1, 2006. 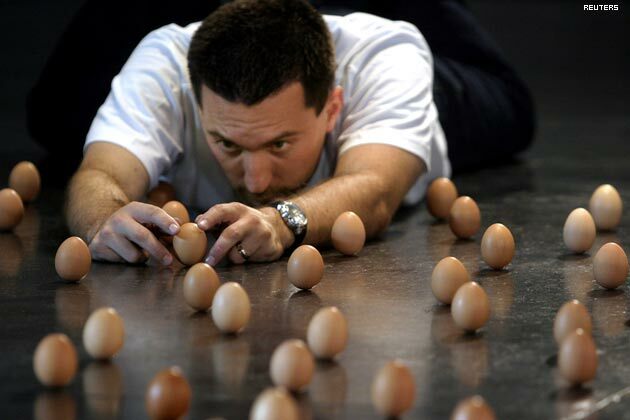 Brian Spotts of the US works to balance 439 eggs on their ends on the floor of the Australian Centre for Contemporary Art in Melbourne on September 14, 2005. Spotts, who lives in Colorado, travelled to Melbourne to attempt a new world egg balancing record which currently stands at 420 eggs. 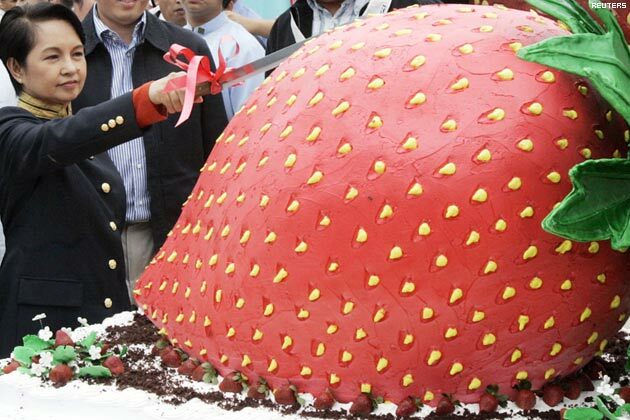 Philippine President Gloria Macapagal Arroyo slices a giant strawberry shaped shortcake that won the Guiness World Record’s record for the largest fruit shortcake during her visit to La Trinidad in Benguet Province north of Manila March19, 2007.